The injection of some much needed cash in 2010 has transformed the Volvo line up with the XC60 demonstrating just how far things have come. 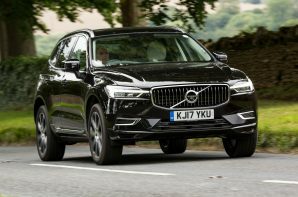 Yes the brand still majors on safety, and there is nothing wrong with that, but it has re found its confidence when it comes to channelling the Swedish design ethic that makes a Volvo look and feel different to the German brands. Designed from the ground up to except a plug-in hybrid powertrain, the XC60 offers good boot space and lots of interior space. The secret is clever packaging that locates the batteries in the transmission tunnel. This does mean that there is no space for a drive shaft but fear not, the electric motor drives the rear wheels which means that you do still get four wheel drive. The front wheels get an equally hi tech 2 litre petrol engine which uses both turbo and supercharging to produce a hefty 299 bhp. When the petrol and electric motor are working together the system tops 400 bhp which is enough to provide hot hatch levels of acceleration. You can also lock the system in electric mode which unlocks a useful 28 mile official range and the likely hood of around 21 to 28 miles in real life although Volvo suggest that anything from 12 – 24 miles is possible depending on how arctic / barmy the weather is. As with all plug-in hybrids the key is to maximise EV running at which point you will see massive fuel bill savings and get genuinely low CO2 emissions. However if you are planning to regularly drive long distances or never intend to plug-in you will get the fuel consumption of a 2 tonne plus petrol SUV. Used as intended the XC60 can deliver day to day EV running with a long enough range to meet many people’s needs. If that sounds like you then it makes absolute sense. If you are one of the 50% of Twin Engine buyers who never goes near a socket then it doesn’t. Unfortunately being over £40,000 it attracts the top rate of VED so it isn’t a cheap option but it is hugely versatile, good looking and offers a premium and thoroughly contemporary interior. It also handles neatly which in a class not overburdened with great drives is better than most of the competition. Just make sure it fits with your daily routine before signing on the dotted line.